After the first week of the 2018 Division I volleyball season, much of the top 25 remains unchanged regarding the teams with numbers next to their names, including Stanford at No. 1 for a second week. However, there was plenty of movement throughout Monday’s updated AVCA coaches poll. With 10 inter-ranked matchups taking place over the weekend, the ranked teams that remain unbeaten were heavily rewarded while a couple ranked teams' winless weeks cost them greatly. Here are five things that stand out in the new top 25 poll. With three returning players who earned all-conference selections from last year’s regional final team, it made sense the Kentucky Wildcats were picked over Florida to win the SEC. Now after an 0-3 weekend with losses to Creighton, Southern California and previously unranked Northern Iowa, the Wildcats fell 11 spots and have plenty to figure out before hosting solid squads in Dayton and Kansas. San Diego fell five spots after winning just one set in two road losses at Washington. The Toreros should be the top competitor to BYU in the WCC, but it will need better performances in the coming weeks against other major-conference programs like Baylor, UCLA and Tennessee. The Texas Longhorns are expected to compete for a national championship each season, and they certainly justified that expectation with a win against Oregon on opening night followed by a five-set, comeback win against Florida. 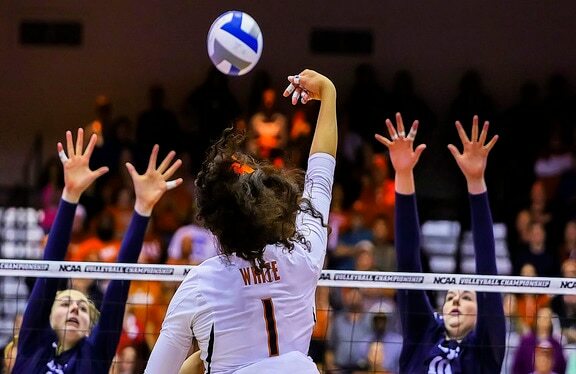 After the Gators beat Nebraska on the Huskers' home floor this past Friday and opened the second spot for the Longhorns, Texas returned the favor to Florida with a game-winning block on freshman sensation Thayer Hall. Texas’ performance on the weekend earned the team seven first-place votes as well. 3. Is Northern Iowa on the fast track to a national seed? One of the teams that defeated Kentucky, the Panthers also dispatched then-No. 13 Creighton in their first game of the season in straight sets. After two top 15 victories, could Northern Iowa be on pace for a national seed? The season is just beginning, but the Panthers, now No. 17 in the rankings, play only two more opponents that are currently ranked on their schedule, including a rematch against Creighton in Champaign, Illinois. This isn’t a nuanced idea, but look no further than the Oregon Ducks for an example of how losing to the second- and third-ranked teams affects ranking. Spoiler: It doesn’t. The Ducks remained at No. 18 despite being 0-2. The same applies for Cal Poly and Colorado State, which lost to Pittsburgh and Illinois respectively, but each stayed in the rankings at the same position. Wins against Kentucky, Creighton and Northern Iowa propelled Southern California past BYU and Wisconsin, two teams that were more than 100 points ahead of the Trojans in the previous rankings. The Women of Troy had to take advantage of being on their home floor before traveling to Gainesville, Florida, to take on the fourth-ranked Gators. Pittsburgh jumped six spots from No. 20 to No. 14. The Washington Huskies also made a substantial leap in the rankings, moving from No. 17 to No. 13 almost 200 points ahead of Pitt. The two meet on Sept. 8 in Pittsburgh. Along with Northern Iowa, the Michigan Wolverines cracked the top 25 following straight-set wins against High Point and Auburn. Michigan State and Iowa State both fell out of the top 25, losing to Tennessee and Oregon State, respectively. Both the Volunteers and the Beavers earned votes.